Claire Searle who lives in a supported living property in Gayton is celebrating after receiving an award for her volunteer work. The 38-year-old, who lives at Sail Close, run by care provider Regard, has been working part-time at the British Heart Foundation shop in King’s Lynn High Street for the past three years. 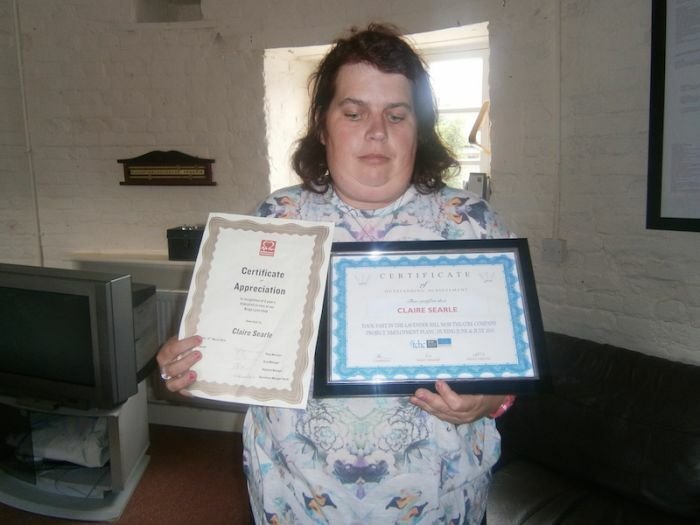 Claire, who has learning difficulties, is now the proud owner of one of the charity’s Certificates for Long Service which is set to have pride of place on her bedroom wall. Said Sail Close senior support worker Jen Hails: “Claire is as pleased as punched with her certificate. It means a great deal to her. To support Claire, the Sail House team helped her identify local volunteering opportunities and worked with her to build her confidence and accompanied her on her first shift. She now makes the journey to King’s Lynn independently. In addition to her volunteer work Claire is also a keen amateur thespian and is a member of the local Lavender Hill Mob Theatre Club. Earlier this year she was among the cast of the group’s Sleeping Beauty production which played to packed houses. Sail Close is a supported living service for adults with mental health needs and/or learning disabilities in Gayton near King’s Lynn. There is a mix of single person and shared self-contained apartments, and a three-bedroom house. The service, which currently has a variety of self-contained and small shared house models, has two vacancies and is undertaking referrals and assessments. Regard, which runs Sail Close, has recently attained the Gold Standard at Investors in People award, one of only four organisations in the sector to achieve the standard. Be the first to comment on "Heartfelt success for Claire"